wheat | Three friends who love to cook! Had one (or more like five) of those days at work where you feel like fleeing the building like it is on fire!? I know the feeling. UGH! Having gone through not-so-great days at work for the past few days, I emailed Candis today and said in an oh-so-dramatic fashion, “I think the sky is falling! !” or something to that effect. She immediately wrote back and said “Chin up girl. Get over yourself”. Well, she put it nicely, but I am so grateful for a friend like her. The ones who aren’t enablers. The ones who hold an intervention when you so badly need one! All of us need friends, true friends who have got your back and are not afraid to be honest. Lindsay Lohan…you listening..get yourself a Candis..STAT!! So after Candis emailed me, I made it through the rest of day, knowing it will all work out..eventually. I just need to continue to do my job as best as I can. I got home, kissed and hugs my babies and then made them an awesome dinner! 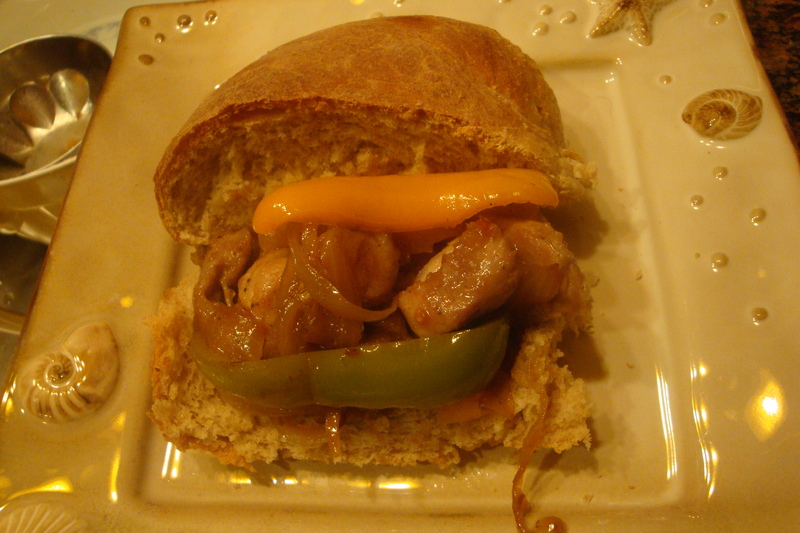 I made Roasted Pineapple Habanero spiced Pork, Onions and peppers sandwich on a homemade honey wheat roll. Yep, I said homemade roll and yes, on a weeknight! The recipe I used, was that easy and so worth every minute. Enjoy the picture. We enjoyed the sandwiches on behalf of you guys! Hope y’all had a good day!